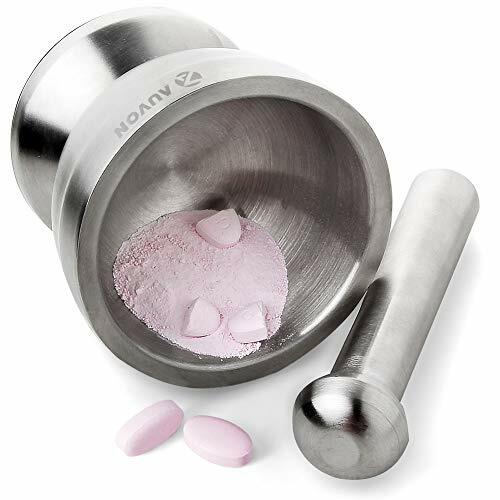 Make your pills or medication easy to be crushed up by getting the pill grinder from AUVON! It is an ideal grinder for elderly person and your pets. If your medication allows it, you can mix the pills powder with applesauce or yogurt, pudding, which can ensure you an easy intake and covers up the bitter taste some pills might have, also making your daily routine more pleasurable. * Warmly attention: Please consult your doctor or medication specification carefully before mix the powder with food. 1. Hold the Mortar Handle and smash the pills up and down to make it granular. 2: Rotate the Mortal Handle to make the pills become powdery. 2. After the first use, wash with water directly. As pill crusher devices, keep out of reach of children and pets. Always consult your physician before using the products. PROFESSIONAL PILL CHRUSING SOLUTION. AUVON is professional in medication management. At this time, AUVON choose this stainless mortar and pestle, an ancient tool that's been around for millennia, to be a pill crusher. A well-constructed mortar and pestle will outperform its other counterparts in terms of ease of use, clean up and convenience. It's quite easy to crush up pills to a fine powder for the elderly and your pet / dog / cat / hourse etc. WHY THE MORTAR. We choose a small one as an outstanding pill grinder with optimized surface contact between the bowl and pestle for excellent pills grinding performance. Choosing the mortar, you don't need to worry that medications may adhere to the accessories of the pill crusher and get less once crushed by other grinders. No worries about big pills getting stuck in your pill crushers. No need to concern to cut big pills into small parts before grinding. This one is perfect for pill grinding. SUPERIOR QUALITY. The bowl has enough strength and bottom weight to remain relatively stationary when applying pressure if you hold the weight of the bowl low in the mid-section, and that has enough capacity for your intended use. This heavy stainless steel has a non-skid base for secure grinding of pills, medications, medicine, spices etc. What You Receive: 1 x AUVON Mortar & Pestle Pill Crusher, our 12-month warranty, and friendly customer service.